The late Rob Stewart’s activist documentary Sharkwater Extinction is an urgent and moving plea for action against the illegal trade in shark fins and more generally for the conservation of marine life in our rapidly dirtier and emptier oceans. Sharkwater Extinction literally begins lost at sea. Diver, activist and filmmaker Rob Stewart recalls how he once surfaced miles from where his boats was in the open sea. He made a decision then to just keep swimming and his survival instincts – this time – saved him. However, it is a foretaste of the tragedy to come as well as a moment when we feel a more pervasive despair at how the Anthropocene is causing a mass extinction, the likes of which have never been seen. Following on from his 2006 documentary Sharkwater, Stewart’s film trots the globe from coasts of Costa Rica, Panama, Africa to his own native Californian waters, documenting with the help of local activists the multi-million dollar trade in shark fins which have mainly become a precious commodity because of an Asian love of shark fin soup. Legal loopholes, political venality, criminal intimidation and secrecy backed with a threat of actual violence confront Stewart and his team and lead many to worry about the filmmaker’s own safety. With many of the undercover investigations, he’s the one pushing forward, testing the limits of what he can get before the security – or worse – is called. 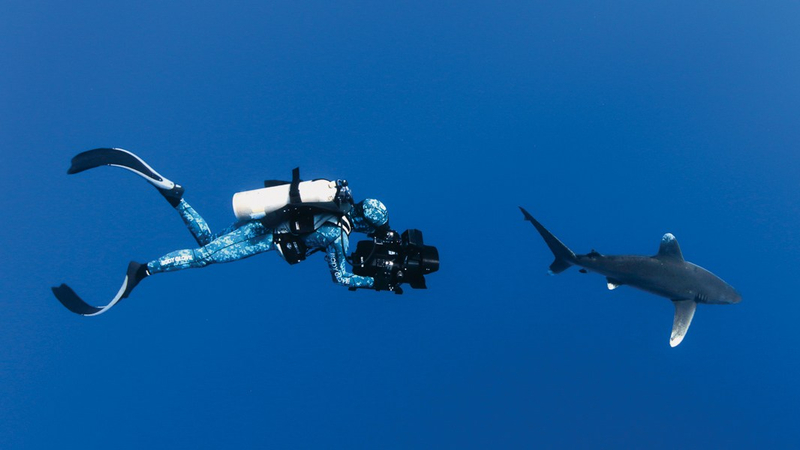 The crew also use drones to capture evidence of the trade, and this along with the beautiful underwater photography gives the film cinematic moments to relish. Unfortunately, the wide-ranging global campaigning leads to something of a patchy narrative. There’s no unifying ‘mission’ to bind the thriller elements together as there was in Louie Psihoyos’ The Cove for instance. And Stewart doesn’t do any infographic explaining of the wider context. In one way this is refreshing, but it also means that some of the most convincing points are not hammered home quite as effectively. According to Stewart, 99% of the shark population has been destroyed in the last three decades, with 100 million sharks killed each year. With such alarming figures cited, it’d be good to have the sources and authorities backing it up on-screen. Stewart recognises that sharks are far less cuddly than most iconic wildlife ambassadors for conservation like the tiger and panda, and his argument that they have been demonised is backed up with many shots of him swimming with hammerheads and other fearsome monsters in apparent safety. But he is also canny enough to show that as an apex predator shark meat is actually highly toxic and a wander around some Florida supermarkets finds shark DNA in a range of surprising products. This isn’t only the Chinese and their soup. Tragically, Stewart’s final film (the director died at the age of 37 in a scuba diving incident while shooting Sharkwater Extinction) also serves as his testament. As such it shows a young man who dedicated his life to marine conservation and to the fight to end of some of the most brutal fishing practices around. Again tragically, the subtitle of the film indicates that the fight might be a lost cause.